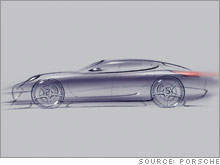 Porsche has announced that it will build it’s Panamera in 2009. 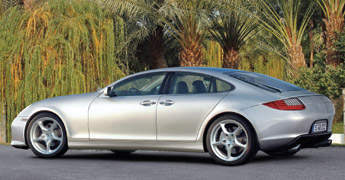 The Panamera is a cross-over, having four doors and a coupe-like roofline. The car will be a front-engine rear-wheel drive and it will be built exclusively by Porsche, not sharing a platform with other manufacturers like how it partnered with Volkswagen for the Cayenne-Touareg platform. Notice the suicide doors? Mazda RX8 style. Porsche expects sales figures to be at least 20,000 cars per year. Porsche currently sells about 9,600 Boxster, about 14,000 Cayenne SUVs and about 8,000 911s every year. The Panamera is expected to compete with the Mercedes-Benz CLS and Maserati Quattroporte, as well as the new BMW cross-over coupe 4WD. Engine offerings will be the same as the front-engined Cayenne which comes in 4.5 litre V8 naturally aspirated (340hp) and turbocharged (450hp) models. I previously blogged about the Panamera here. A concept version is expected to be displayed this September at the Frankfurt Motor Show. I cannot wait to see it!